Diamond quality is extremely important in choosing the right diamond jewellery. Not only will it have a major impact on the price and value of the rings, pendants or earrings, it will also largely define their beauty. The primary source of information on diamond quality is a diamond grading certificate. 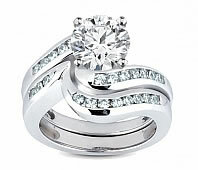 Diamond rings certificates show a great deal of information on your precious stone so you are certain of its price. You should avoid diamond jewellery without a certificate, not only is the quality unsure but the origin of the diamond may be in question as well. The price of a diamond is a complex issue, but usually it’s represented by the 4 C’s: diamond color, cut, clarity and carat weight. Below we’ll expand on why diamond clarity is maybe the most important factor in finding a quality diamond. When a diamond has low diamond clarity, it will demonstrate imperfections visible to the naked eye. This means you can actually see internal flaws or blemishes on the stone, which take away from their happiness. When buying quality diamonds you should choose for diamond clarity of at least VS2, which stands for very slightly included. This clarity grade nearly forever guarantees a diamond that shows no imperfections to the naked eye. If you want a diamond that even under 10 x magnifications shows no blemishes or inclusions of any kind, you’re looking for a perfect diamond. This type of diamond is extremely rare while, which means it has a much higher price attached to it.